Tommy Bridewell finally broke his winning duck in the British Superbike Championship with a finely judged ride in race one. The 26-year old snatched his maiden victory from Shane Byrne by just five thousandths of a second after the first race at Cadwell Park was stopped five laps early due to worsening weather conditions. In what would be only his second podium of 2014, his seventh year competing in the class, Bridewell went on to dedicate the win to brother Ollie, who lost his life at Mallory Park in 2007. “It is fantastic for me to get this first win,” he said. “I have been trying so hard to push throughout my career with so much effort going into it and you have good and bad days and this is one of the good ones. I am feeling emotional about this victory and I want to dedicate it to my brother Ollie,” said a visibly emotional Bridewell. 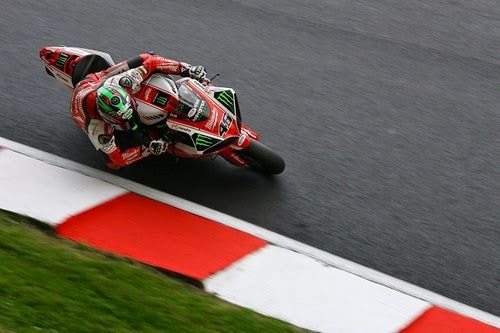 The second race was a treacherous affair and with heavy rain falling, Bridewell stayed upright while others fell around him to bring it home for third place, confirming his place in the ‘Showdown’ in the process. Bridewell’s results see him jump up to fourth in the overall standings, 19 points behind Ryuichi Kiyonari. Next Next post: Hickman storms to debut BSB victory: "this win is certainly for Simon"